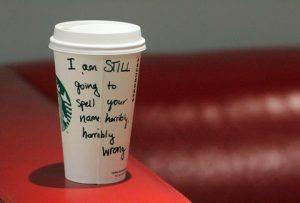 I have bought quite a few cups of coffee in Starbucks over the last couple of years and, more often than not, I have then been asked my name. They have never got it right. Not once has someone been able to get Giles right, even when I have spelt it out to them. So, their attempts at personalisation have backfired on me, rather than feeling more special, I’m either left feeling a bit frustrated or a bit of a freak. For a while I wondered if this was just something that happened to me and that I was particularly unlucky. Then one day my son spontaneously mentioned the same thing often happened to him. Ewan, for that is his name, is clearly smarter than me. Nowadays, he doesn’t even bother to try and get them to use his real name. He calls himself “Fernando” after Fernando Torres and more often than not, they get this right. I asked some colleagues at work about their experience and a number of them mentioned Tossed Salads. It’s clear that Tossed have either been speaking to Ewan or have come up with a similar ‘solution’ for themselves. 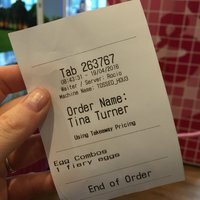 When you order your salad to take away in Tossed, you are allocated a famous person’s name rather than being asked your own name. It avoids all the difficulty of trying to spell out your name but also has the potential to make you smile. Ollie was clearly amused when he became Barbara Streisand. Tom and Susannah enjoyed their time as Kylie Minogue. 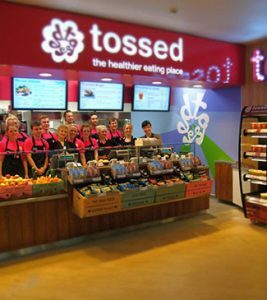 And the moral of this story is that I’ve decided to add Tossed to my portfolio of places for lunch and am going to name myself ‘Bruce’ (as in Springsteen) in Starbucks.